Karma Yoga is a sacred haven for people of all ages and all walks of life. We welcome all students and offer a variety of yoga, meditation, workshops and other healing modalities to support, deepen and meet your practice. Our teachers are all fully-certified and unique individuals that wishes to support you on your journey. Our classes will empower you and inspire you to be more confident, become more peaceful, live freely and awaken you to discover your true potential. We are inspired by the magical island Bali, island of Gods. Let the Bali Spirit Free your Soul! Karma is a Sanskrit term that literally means action or doing. In the Buddhist tradition, karma refers to action driven by intention which leads to future consequences. Whatever we put out in the Universe is what comes back to us. Hence Karma says : Be yourself, and surround yourself with what you want to have in your life. Don’t’ forget When we change who and what we are within our hearts, our lives follow suit and change too. Karma is our greatest teacher, making us accountable for what we do and giving us opportunities to learn from our mistakes and make amends. So be Good and Do Good; It is a cosmic law; applies to everyone, everywhere, all the time. Originally from Norway, she has lived in Australia, Denmark and Sweden, and now based in Dubai for 5 years. The main style of yoga she teaches is based on the Zuna Yoga® approach and at the centre of this approach lies a unique system of Breathing that stimulates the vital energies of the body, providing strength, conditioning and balance to the mind and the body’s systems. Her classes incorporate asana, pranayama, meditation, mantras, bandhas and mudras. The practice is directed toward awakening us to the what we refer to as the true “promise of yoga”: to live free and empowered, to experience the bountiful treasures of life, and the realization of purpose and success. Benedicte will passionately support YOU to reach your goals and on your path to awakening your soul’s purpose, to find self-acceptance and inner balance, let go of limitations, full fill dreams and experience your own magic! Yoga is a journey, not a destination. Marsha teaches students of all levels and all ages hatha, vinyasa flow, and swing yoga.Â She always includes in her practices elements of meditation, pranayama and yoga nidra to create a unique and well-rounded experience. Masha treats every student as her teacher. Because teaching is all about learning. In teaching, he provides a non judgemental environment and encourages students to focus on the breath, proper alignment, challenge themselves, while remaining safe, playful and lighthearted. To Nitai, yoga is a way to control the monkey mind, to bring peace within and awaken pure devotion to our Divine Source. In one word, he describes himself as a learner. Apart from yoga, he’s also passionate about singing Kirtans and doing art. He’s been practicing ashtanga, hatha and dynamic vinyasa yoga styles for more than 5 years. His class is an “all level” class and open especially for those willing to be challenged and expand their practice. His teacher training includes 500 hr Yoga Alliance courses at Radhika Yoga with Jayaprada Radhika and Jesús Qcori Malki & several workshops. Reconnecting body and mind, moving awareness out of the cerebral, instrumental, and patterned space of our heads into an open, non-judging landscape of the whole body offers endless opportunities to discover the depths of Self, to be with what is and process things as they are. Yoga is an inquiry into what it means to be alive, embodied, sensing, experiencing, focusing, engaging and interacting with life. The practice of presence. My classes are relaxed explorations of this presence and are suitable for everyone. Sometimes strong and fluid & sometimes softer with long holdings but always slow and deep with emphasis on the experience of movement and sensations within. I love the rhythmic fluidity of Vinyasa, the static strength of Hatha and delicious depth of Yin â€“ whichever the style I teach I tend to offer a blend of movement sequences through which we are strengthening, stretching, balancing, expanding, grounding and exploring energies within, returning to ourselves. That path led her to teaching classes such as dancing Aerobics, Stretching, Body-ballet, Belly dancing, Tae-Bo, Step -aerobics, Barre, Pilates etc. In 2010 she started her Yoga career. She has studied under teachers such as Yaroslav Karaaba, Andrey Siderskiy, Ravinder Jangra, Sadhguru Vasudev and Sunil Singh. Kate adores her job as a yoga teacher and she says she can’t call it work, it’s a pure blessing, joy and happiness and based on unconditional love. She is so grateful to share her experience and knowledge with the yoga family and being in the yoga community! Kate teaches all styles of yoga with great enthusiasm. Absolute Yoga Academy. YA 200Hrs. Yin/Yang TT with The Yoga People. YA 200Hrs. Chakra and Crystal Healing Level 1. She continues to learn and study many related topics. She will be attending a 300Hrs advanced Teachers Training in July. Expect her classes to keep you energised and leave you in a sense of peace. Yoga Alliance registered (RYT200) for the last 10 years and now also Yoga Alliance YACEP. Passionate about yoga therapy and beliefs in the strong connection between health, beauty, and wellness. Ayurveda, Chinese Med & Naturopathic Practitioner. Specialist in Energy Healing, based on the belief of our need for self-awareness and self-realization to create the balance between body, mind & spiritual. Mantra: Radiance is reflected from within, be a good example for yourself and others. Her classes are technically intense workouts, focussing on increased stamina, strength and flexibility, as well as stress reduction. you will leave feeling energized, able to sleep better, and happier. As an experienced martial art instructor, a calisthenics coach and a yoga teacher Allaoua explore all aspect of body’s biomechanics and metabolism to understand and share every methods and practice that empower human being. Adept of Kriya Yoga, he is certified RYT200 from the prestigious Zen Den School of Yoga in Florida and has received his training from Guru Ira Om in Ashtanga Vinyasa, Guru Munishwer Goswami in traditional Hatah and Sivananda, Guru Rangaji Ramanchandran in Iyengar and Restorative Yoga. Specialized into anatomical alignment Allaoua exclusively developed a POWER VINYASA® class as a true bridge between the traditional and modern approach to Yoga. Providing the perfect balance between ancestral Hatha isometric Asanas associated with an explosive aerobic Vinyasa flow. Ideal for all level, all Allaoua’s classes are sparked with Pranayama and Dhyana along with many useful information and tips about nutrition and wellbeing. Rima is dedicated to supporting people of all fitness levels to work towards a healthier lifestyle. Rima loves an upbeat, fun class to get you sweating and feeling great after. Her favourite workout is Barre class, as it tones the whole body while also getting the heart rate up with good beats to workout to. Rima loves to challenge her clients to push themselves out of their comfort zone, knowing they will be pleasantly surprised with their progress and achievements! To expand her yoga practice and teaching, she completed a Yoga Swing Teacher Training in June 2011. For over seven years, she has been finding happiness in helping students understand and explore what their bodies can do through Flow Yoga, Power Yoga, and Swing Yoga. Formulating a fun and rewarding sequences is her goal in each of her classes. Since that time Alexey hasÂ made fiveÂ individual trips to Mysore. He also attended teachers training withÂ David Swenson, seminars and classes with Richard Freeman, Lino Miele, Petri Raisanen, Eddie Stern, Mark DarbyÂ and others. Alexey started to teach yoga in 2010 in Moscow Ashtanga Yoga schools: Ashtanga Yoga Shala and Ashtanga Yoga Center. He has been teaching in Dubai since 2015. Alexey followsÂ a traditional way ofÂ practice. This practice will be interesting for the practitioners of all levels from beginners to advanced. A theatre actor turned Yoga teacher, Chandnee has been teaching professionally for 7 years and feels Yoga is the best investment she has made. She’s not only been travelling and teaching across India but has also conducted various yoga workshops in China, Taiwan, Nepal, Bahrain and is currently teaching full time in Dubai. “It’s not only how you spend that one hour on the Yoga mat. It’s also about how you spend the rest of your 23”, Is what she strongly believes in. She also believes that a balance of yogic diet, shuddhi kriyas and observing mindful silence is necessary for all, in today’s stressful lifestyle. Chandnee is also an attuned Reiki Master Practitioner and believes in spreading positivity through her Yoga sessions. She supports students of every background, helping them find greater depth, awareness and well-being in their practice and their lives through Yoga. She is a certified 200 Hour Hatha Yoga Teacher from an institute in Goa, India and has about 7 years teaching experience. She is also a certified Reiki Practitioner, Crystal Therapy certified, Sound Healing- Tibetan Singing Bowls Certified, as well as practising Thai Massage and Aromatherapy- incorporating all into her practice. She is also certified to conduct Osho Meditations and is a Spirit, Wellness and Life coach. To her yoga is all about feeling free in your body and freeing your mind, healing yourself from within. Using asanas, meditation and pranayamas as vehicles to obtain this. Unity of the mind, body and soul taking us on the path towards pure Samadhi. Balli is a Master in Yogic sciences & post graduate in Yoga therapy with great knowledge and experience in various systems of yoga. After graduating from Swami Vivekananda Yoga University Balli did his post-graduation in Yoga therapy and MSC in yoga from Syasa Yoga University where he was the winner of the National Yoga Olympiad in 2009. He teaches Power Yoga and Hatha Yoga from his heart. He is experienced in teaching advanced Yoga and meditation classes. He also conducts Yoga instructor courses and PERSONAL TRAINING for those who are interested in advancing their skills in yoga and personality development. You will love his teaching. He is experienced in teaching advanced Yoga and meditation class. He also conducts Yoga instructor course and PERSONAL TRAINING for those who are interested in advancing their skills in yoga and personality development. You will love his teaching. Yoga always fascinated me and I took to yoga at the age of 8 since then Yoga has been my best friend, an important part of my life. As I grew older I realized Yoga is my first love and decided to pursue it. After completing my graduation I did my post graduation in Yoga therapy and MSC in yoga from Syasa Yoga University where I was the winner of the National Yoga Olympiad in 2009. In my class my first goal is to make my students flexible as well as strong, guide them to correct breathing techniques and postures along with a spirit of fun and playfulness and gradually guide them towards going deeper into their practice. My students step out of the mat feeling refreshed and balance and nourished in mind, body and soul. The practice has made her stay steady and focused, while maintaining a humble attitude, living and loving each moment to the fullest. After more than 10 years of dedicated Ashtanga Yoga practice, Nathalie made her way to Mysore/India in 2014 to further her studies and deepen her knowledge with (Paramaguru) R. Sharath Jois at the Shri K.Pattabhi Jois Ashtanga Yoga Institute (KPJAYI), and she has been going back ever since. In January 2019 Nathalie became the first Lebanese practitioner to be authorized level 2 by R. Sharath Jois to teach Ashtanga Yoga. Daphne started her professional journey as a fitness instructor and rehab movement coach in 2008. She graduated with a Bachelor of Science degree in Physiotherapy and is licensed personal trainer for over 10 years now. She is a Level 3 Personal Trainer in the UAE, certified by Dubai Sports Council, ACE and PTAGlobal certified. In 2016, Daphne studied yoga in the Philippines, Bali and Dubai to pursue her love for yoga and further her career. She is a Yoga Alliance registered yoga teacher, with foundations in Ashtanga Vinyasa, Hatha and Aerial Flow Yoga. She has also been certified in Mat Pilates and Barre Pilates Foundations. She is fascinated with the discipline that involves body and mind through movement sequences inspired by yoga and Pilates, and that inspires her to teach her classes with great success. Dionne has a fresh uplifting style that supports her students in opening up to their highest potential. In Vinyasa Flow she uses the breath with a creative combination of dynamic flowing movements, peppered with elements of Iyengar’s focus on alignment of the body and some funky tunes to improve strength, flexibility and balance in the body and mind. The students leave the class feeling energised and exhilarated. 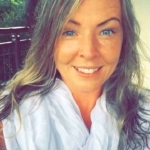 In her teaching, she focuses on connecting breath to each movement and challenges her students with a transformative style of yoga sequence that is blended of flexibility and strength. By using body and having mind present; find true self, learn healing process, and change perspective in life. Since she got certified in Bikram yoga in 2012, she had traveled and taught internationally for 3 years; USA, Mexico, Brazil, Kenya, the UK, Scotland, Ireland, Switzerland, Norway, Denmark, Sweden, Austria, Thailand, Korea, and Indonesia, till she decided to move to United Arab Emirates in 2015. She is currently teaching yoga full-time in Dubai, but still travels to teach yoga workshops. She is certified in Bikram (Bikram Yoga / US), Vinyasa (Jared McCann Yoga / US), Hatha (Agama Yoga / Thailand), Ashtanga (Tattvaa Yogashala / India), and Cyoga (Carmen Aguilar / South Korea). As a teacher, she is known to care deeply about her students and their practice. Her attention and adjustments are highly personalized, to support the individuality of each body. She encourages. She challenges. Mandy is a YA RYT certified yoga and meditation teacher with a focus on simple, sattvic lifestyles, wellness, and spirituality. Initially drawn to the discipline and quiet required to practice properly, and the surrender required to follow direction, Mandy began her yoga practice over 10 years ago in New York City. As well as a Bhakti yoga practitioner, she is a four-time Yoga Alliance certified yoga teacher with over 1000 hours of certification & training specializing in traditional Hatha yoga, meditation, pranayama, and diet and wellness. She has taught in yoga studios, teacher’s trainings, workshops, hosted corporate wellness events, and developed community yoga outreach programs in India, the USA, and Dubai, before eventually settling in a traditional Indian ashram at Govardhan Eco Village in the rural mountains of Maharashtra, India. Mandy eventually moved on to live, teach, and practice yoga in ashrams around the world and has recently returned to Dubai to teach yoga full-time in hopes to further share the philosophy of a sattvic, well-balanced lifestyle. I began my yoga journey over ten years ago in Dublin, Ireland while recovering from a shoulder injury. I instantly fell in love with the practice and believe yoga is my ultimate passion in life. As my own practice continued to deepen I travelled extensively from India to South America to many locations in Europe soaking up the teachings and styles of a verity of teacher. I finally decided to do a teacher training and completed a 300 hour Jivamukti TT under the renowned David Life and Sharon Gannon. I teach a rigorous class with a strong focus on core strength, enthused by a love of learning I have a passion for encouraging others to grow and develop. At Karma Yoga we believe that we all rise by lifting each other, by establishing strong and trusting partnerships we support each others growth and success. We are proud to introduce our valued partners below. All payments once processed are non-refundable under any circumstances. Last admittance to class is 10 mins past the start of the class. Bookings should be made online in advance to guarantee your space. Special workshops such as Soundhealing is not included in packages. Students must check in at the reception at least five minutes before the start of your class, even if you have an online booking. All students must inform the teacher of injuries for the teacher to adjust your practice accordingly. Karma Yoga reserves the right to refuse admissions. In case of class cancellations, customers need to inform Karma Yoga one (2) hours in advance of the start of the class to avoid any charges. Cancellation policy for packages: No-show’s or late cancellation will result in (1) one class/day getting deducted from your respective package. Karma Yoga reserves the right to cancel classes one (1) hour before the start of the class. Freezing is allowable twice for the 12 months unlimited memberships. Total number of freezing days is 60. Freezing is allowable once for the 1, 2, 3, 4 & 6 months unlimited memberships. Total number of freezing days is 30. Karma Yoga waives all liability client who does not follow the instructed class or has not disclosed medical conditions or recent injuries. Please do be aware that it is the student’s responsibility to inform the instructor if you feel unwell or any discomfort. By using Karma Yoga facilities you accept that there is a risk associated with all forms of exercise either during or after. It is the student’s responsibility to practice within their personal limits and to decide, whether or not to follow the advice and guidance provided by the yoga teacher. Any personal injury or fatality incurred before after or during the classes would be under the student’s sole responsibility, where Karma Yoga and its teachers hold no liability. Please do not touch any of the displayed artifacts, statues and artwork. Mobile phones should at all times be kept on silent mode within the studio. No phones allowed in the practice rooms. Karma Yoga accepts no responsibility for any property left, theft or damaged property on the premises. Please be responsible for your belongings. Please return lockers keys to the reception after use.